The recent horrifying massacre at the offices of a French newspaper is a new low in a cultural battle that has plagued the Paris region for decades. Transits and progressions against the chart for modern France at the time of the killings point out some of the dynamics which are boiling over of late. France natal Jupiter conjunct Neptune in the Seventh House: suggesting generosity and openness to that which is foreign. The North Node at the Descendant additionally suggests the possibility of ceding power to those foreign to the nation. 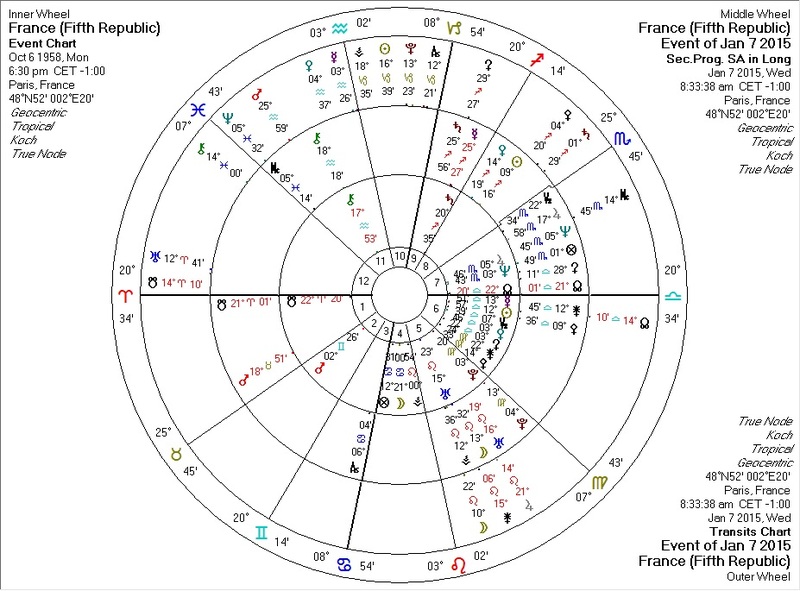 Transiting Pluto in the Tenth House square France Mercury ruling the Sixth House: changes in the political structure and strife involving the general population. Transiting Pluto trine France Pallas: ethical self-restraint removed. Transiting Neptune conjunct progressed MC and quincunx France Venus, ruler of the Seventh House: "foreigners" take the spotlight and throw confusion into relations with outsiders in general. Transiting Uranus quincunx France Uranus, ruler Eleventh House: jarring shifts in the public sphere. Transiting Saturn in Sagittarius in the Eighth House quincunx France Mars, ruler of Ascendant: hidden struggles involving culture trouble the face of the nation. Progressed Mars completes a T-square with France's Chiron and Uranus: the slow tearing open of wounds in the public sphere. The great libertarian theorist Hans Hermann Hoppe points out that open immigration is inevitable in democratic societies. Politicians cannot resist the easy path to retaining their power by promising taxpayer-funded goodies to poor immigrants who will then vote for their re-election. Welfare statism then incentivizes unemployment and the entitlement mentality, fueling resentment and eventually violence against the "haves" in the society who are funding their existence. The State encourages this, because it can use the resulting tension to scare the tax-sheep into believing that the State is necessary to protect them against the horde, when in actual fact it is creating the horde. As with most State action, the State creates the problem and then posits itself as the solution. The problem then worsens until society collapses or the State temporarily retreats. The extremely interventionist foreign policy of France and other Western nations exacerbates these problems even further by inciting hate in the nations and cultures they target, and by displacing native populations many of whom then flee Westward. Thomas Jefferson himself, toward the end of his life, saw that the American republican experiment (and by extension, modern representative democracy) was a failure. Mainstream historians, ever the protector of the State, do not share with us the ideas that Jefferson later promoted: that to insure peace and freedom we should organize into much smaller autonomous structures.